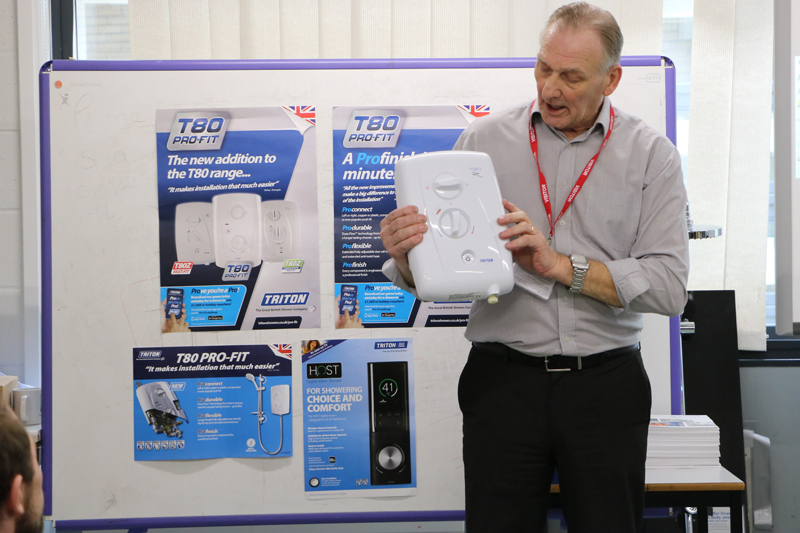 Steve Saunders, Senior Technical Manager at Triton Showers, has been running training courses for over 25 years. Here, he reveals some of the most frequently asked questions received from installers. What is the minimum water pressure requirement for an electric shower designed to connect onto the mains cold water supply? 10.5kW showers: 1.5 bar minimum running pressure at a minimum flow of 11L per minute. In most cases the mains cold water supply will provide adequate pressure and flow. However, if the supply is unable to meet requirements, an electric shower can be connected to a cistern fed pumped supply. How do you determine the pressure you will get to a showerhead when a mixer shower is connected to a gravity supply? The principle is that for every 1m head of water – as measured from the base of the cold water cistern to the top of the showerhead – there will be a pressure in the showerhead of 0.1 bar. This is a theoretical pressure, as restrictions within pipe fittings and the shower mixing valve will reduce the pressure slightly. Providing only minimal restrictions are present in the supplies and mixing valve, the additional measurement (height) of water within the cistern will usually compensate for pressure losses in the supplies. A shower requiring 1 bar minimum operating pressure would therefore need to be connected to a cistern located 10m above the showerhead. I have been called out to a thermostatic mixer shower that is supplied from a combi-boiler and I cannot achieve a hot enough showering temperature. What could be the problem? One common cause of this symptom is that the flow of water through the shower is too great and the boiler is unable to heat the water to the required temperature. Isolating the cold supply and measuring the hot water flow and temperature through the mixing valve on its maximum hot setting should establish whether this is the case. If so, it will be necessary to fit some form of flow limiting device on the inlet or outlet of the shower. The second common cause is a blockage has occurred in the hot supply, thereby, limiting the amount of hot water available to mix with the cold. Turning the temperature control of the shower to fully hot then fully cold should provide an indication of whether the hot and cold supply entering the mixing valve are of equal volume. How much flow can I expect to get from an electric shower? The performance of all temperature stabilised electric showers is governed by the following factors: kilowatt rating of the shower; water temperature entering the shower; voltage to the shower and the preferred showering temperature. At a showering temperature of 38°C an electric shower will deliver 2.5 to 3.5L per minute in winter, increasing to 5-10L per minute during the warmer months. The higher the kilowatts, the greater the flow of water for the desired temperature selected. I have fitted a thermostatic mixer shower to a combi-boiler system only to find the shower temperature is fluctuating, I thought a thermostatic mixing valve was supposed to remain at a constant temperature? The most common reason for this is when the combi-boiler is not fully modulating – i.e. the gas flame is not regulated in sympathy with the flow of water through the heat exchange unit – and is, therefore, not maintaining stable hot water temperature to the shower. As hot water entering the shower increases in temperature a thermostatic mechanism will adjust to restrict hot water entering the valve. In turn, flow through the boiler is reduced and the temperature reaches a point where the thermostat switches off the burner. Water temperature will then reduce before the thermostat resets, this will result in the shower constantly cycling between hot and cool. Is it possible to connect an electric shower to a cold water cistern and if so, what head of water is required? An electric shower can be fitted to a cold water cistern providing the head of water is adequate. Typically, electric showers require between 0.7 and 1.5 bar minimum operating pressure. One metre of head is equivalent to 0.1 bar, therefore, there must be 7–15m head, depending on the manufacturers’ specifications. Head of water is measured from the base of the cold water cistern to the showerhead. Some electric showers incorporate an integral pump. These units can be installed where the base of the cold water cistern is as little as 75mm above the top of the unit. This is sufficient head to prime the pump, the showerhead can in some cases, be in a negative head position. Next : Win an LDV electric van worth over £60,000!